Full meals or traditonal tamilnadu meals or kalyana sappadhu, whatever we call, i always enjoy very happy cooking a full meal. 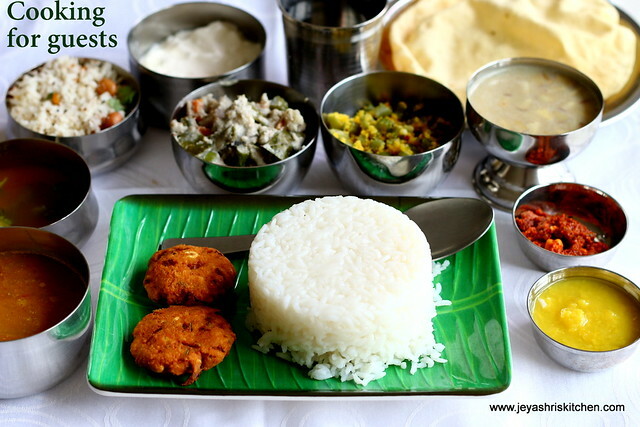 Though now a days , we cook so many variety of cuisine for guests, this traditional tamil nadu meals will always have a special appreciation always. Two weeks back when i had guests at home i made this traditional lunch. Though i felt later , it could be more elaborate with one more curry and a sweet pachadi, still the guests enjoyed the meal. 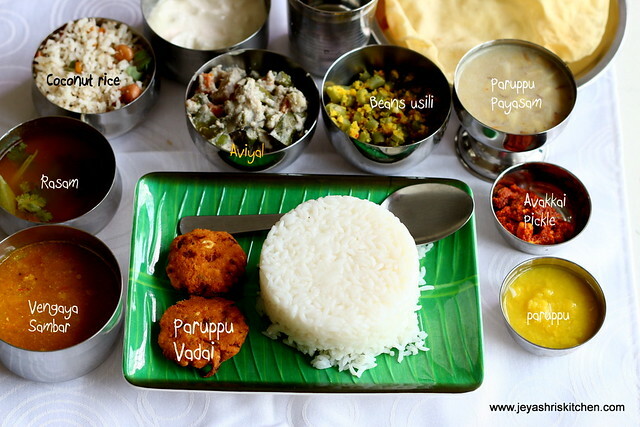 Will post one full tamil nadu meals soon. My mom always used to make this menu for newly married people who visit our place during our childhood days. My mil's place the menu will be slightly different, which i will post soon. I made cucumber raitha but forgot to keep while clicking. You can add potato curry, tomato sweet pachadi in the menu. Enjoy cooking and see you all with more interesting recipes in this week. Have a fantastic sunday. Excellent.Traditional recipes are always a hit,yours super hit. I wish to be your guest for next post... Wounderful. Perfect Resturant lunch menu . The only difference is the big plate and the small cups inthe resturant. I eagerly wait for your Sunday posts on cooking for guest series. Without fail, you blow my mind every week :) Haven't had such a variety filled spread in such a long time. 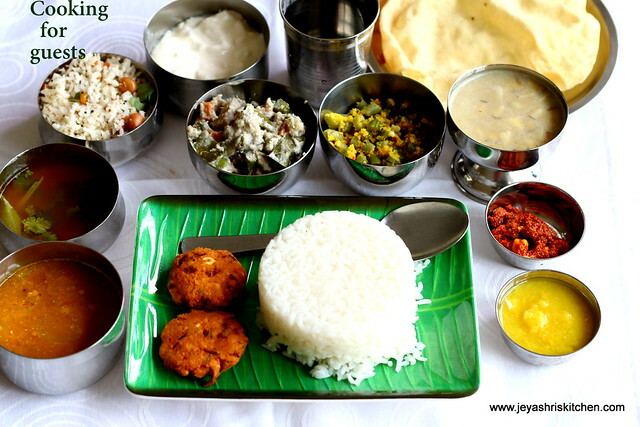 Beautiful platter, looks very delicious and inviting..
One should be blessed to be ur guest Jeya, wat a spread.. It will be nice if you could give time saving tips, what could be prepared the previous day, and what should be cooked in which order to save time.